If community pharmacy is to move forwards, fulfill its potential across health and wellbeing and thrive professionally and commercially, the sector requires unity of purpose. Such unity must be based on a shared passion for pharmacy and agreement on fundamental points of principle. 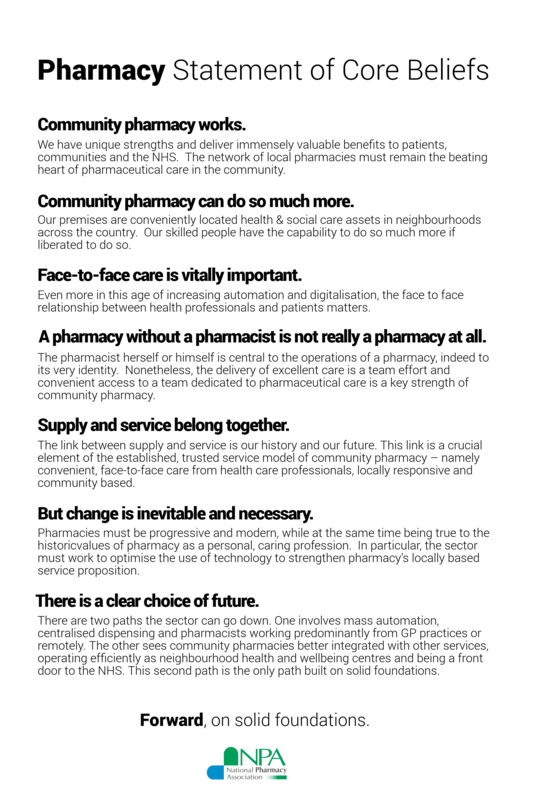 That is why the NPA is asking everyone with an interest in the success of community pharmacy to consider this brief list of ‘core beliefs’; a simple, but hopefully meaningful statement that we can all rally around and use as a reference point for everything people say and do in the name of community pharmacy. We have unique strengths and deliver immensely valuable benefits to patients, communities and the NHS. The network of local pharmacies must remain the beating heart of pharmaceutical care in the community. Community pharmacy can do so much more. Our premises are conveniently located health & social care assets in neighbourhoods across the country. Our skilled people have the capability to do so much more if liberated to do so. Face-to-face care is vitally important. Even more in this age of increasing automation and digitalisation, the face to face relationship between health professionals and patients matters. A pharmacy without a pharmacist is not really a pharmacy at all. The pharmacist herself or himself is central to the operations of a pharmacy, indeed to its very identity. Nonetheless, the delivery of excellent care is a team effort and convenient access to a team dedicated to pharmaceutical care is a key strength of community pharmacy. A solution to primary care access, pressure lies in liberating the clinical potential of all pharmacists, especially those available without appointment, in community pharmacies right across the country. Supply and service belong together. The link between supply and service is our history and our future. This link is a crucial element of the established, trusted service model of community pharmacy – namely convenient, face-to-face care from health care professionals, locally responsive and community based. But change is inevitable and necessary. Pharmacies must be progressive and modern, while at the same time being true to the historic values of pharmacy as a personal, caring profession. In particular, the sector must work to optimise the use of technology to strengthen pharmacy’s locally based service proposition. There is a clear choice of future. There are two paths the sector can go down. One involves mass automation, centralised dispensing and pharmacists working predominantly from GP practices or remotely. The other sees community pharmacies better integrated with other services, operating efficiently as neighbourhood health and wellbeing centres and being a front door to the NHS. This second path is the only path built on solid foundations. Want to be inspired, need a challenge?